The longest flight I have ever been in before my Europe trip was when I went to Saipan to visit my dad, and it was only a four hour flight. On the way home, I had already watched an in flight movie, read a little and we were still about an hour away from Manila. My brother and I were so restless that when we finally saw the Manila city lights, we were so excited that we almost started jumping up and down in our seats. I couldn’t imagine how I could manage a flight longer than that until I flew to Europe last August. My flight from Manila to Europe was almost 16 hours long, with a stopover at Amsterdam to switch planes to get to Madrid. The Manila to Amsterdam was a killer with almost 12 hours of being up in the air. You can see how antsy that entire flight made me. I managed to watched four movies, read a lot and slept a lot, and still, the flight is not yet over. It almost drove me nuts, if I wasn’t so excited to get to Europe. I guess I would have been less antsy if I was seated with my friends on the flight, but as luck would have it, I was given another seat a few rows back from them1. I shared a row with a guy that I did not end up talking to at all, save for the occasional “Excuse me” when I had to squeeze in to get to the rest room. I remembered that particular time while I was reading The Statistical Probability of Love at First Sight by Jennifer E. Smith that I borrowed from Pinoy Book Tours. They say people who meet at airports and share flights together have higher chances of falling in love with each other. I don’t really know why — maybe it’s because of the enclosed space, the length of the flight, the novelty of meeting someone new in a sea of people who is also heading your way. Perhaps it’s the idea that meeting the love of your life on the plane is a cute story to share in the future. I don’t know really, except that that obviously did not happen to me. ;) Jennifer E. Smith explores this idea in her debut novel with Hadley who missed her flight to London to attend her father’s wedding (sans the plus size wedding gowns). As she waits for her next flight anxiously, she meets Oliver, who is also heading to London and who becomes her seatmate. Hadley and Oliver had no idea that the missed flight, this chance encounter and the next twenty four hours will change their lives. This novel is both cute and sad in a lot of ways, and I was really surprised with the sadness aspect that it had. I was really expecting it to be just cute because of the premise, but I was pleasantly surprised at the depth of the issues that Hadley and Oliver had. Hadley was angry at her dad for leaving them without any notice, for breaking their family and for having the nerve to invite her to the wedding. Oliver’s own issues somewhat mirrored Hadley’s, but being a guy, he wasn’t one to share about it. The two main characters share an easy friendship at first, going through a typical getting to know phase albeit a bit condensed. They never felt too old for their age, even if their concerns were a little more serious than the normal teen had. Their conversations were witty and full of poignant things, and it’s actually also the kind of conversation that I would like to have if I meet someone at the airport and end up sitting next to them in the next, oh, twelve hours. 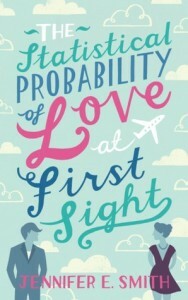 The Statistical Probability of Love at First Sight by Jennifer E. Smith will be out by January 2, 2012. Thanks to Pinoy Book Tours for the ARC! Ah I’m jealous that you’ve read this already. Cute and sad eh? Hmm. It’s hard to describe the depth of emotions in “The Statistical Probability of Love at First Sight”… while it is super romantic and definitely cute, there are moments of sadness and grief that definitely resonate with you while reading!